There was a time not too long ago when Chrissy Teigen was the apple of the internet's eye. Her "savage" clapbacks, rejoinders, jokes, and insults were the toast of the town, and every viral media outlet from BuzzFeed, to the DailyDot, to Mashable, to us here at Distractify reveled in the beatdowns she'd lay on mom-shamers and gross politicians online. But with the way the web works, no one stays everyone's darling forever. Especially when old tweets begin to surface. Old tweets can cost a multimillion-dollar-earning director a Marvel franchise. Old tweets can cost you Oscar hosting gigs, or they'll contribute to an imminent "L" during a rousing rap beef that may or may not be all a huge publicity stunt. Sometimes, the old tweets are blown out of proportion and people bounce back form them. Because if there's one thing the internet is good at enabling, is outrage culture. But it's difficult to find anyone who is currently in support of or willing to pardon Chrissy Teigen's old tweets where she repeatedly made references and jokes about suicide. On top of all that, many people are viewing some of her older tweets as homophobic and transphobic. We've listed some of the older tweets here, that the model/TV personality/author tweeted out when she was between the ages of 25-26 years old. Teigen became the poster girl for "YAS QUEEN" proclaimers everywhere for her body positive tweets. She shared photos of her stretch marks and gave "real" commentary on how much pregnancy stinks sometimes. Her terse and often brutal responses to her detractors had people applauding her no-filter social media presence. Teigen was often celebrated as being a "strong female role model" that women should be proud to emulate. Chrissy has become just as well known for being outspoken, successful, and multi-faceted as she is known for her modeling. And her willingness to be open about her insecurities about her own body, despite being a professional "pretty girl," resonated with many people. That same "body-positive" attitude Chrissy was praised for was called into question by fans online, though, when tweets making fun of popular singer/celebrities Lady Gaga and Mariah Carey were also unearthed. While some of Teigen's tweets, like making fun of a young woman's suicide attempt, are difficult to defend, the "transphobic" tweets in question are being cut some slack by people online. With regards to Thailand's "reputation," Teigen does mention in her tweet that she's not a fan of how the country is portrayed. And it is a perception that many people have of the country and ex-pats who live there. Heck, SNL even did a whole sketch on it that made a big kerfuffle online, after Thai officials were angered over the Rosetta Stone comedic bit. 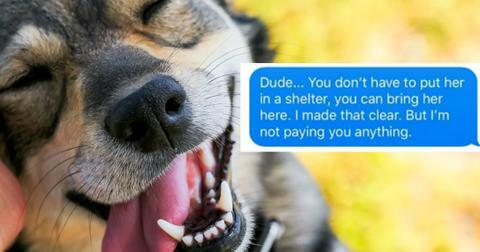 A homophobic tweet that's circulating social media is a point of contention for some as well. 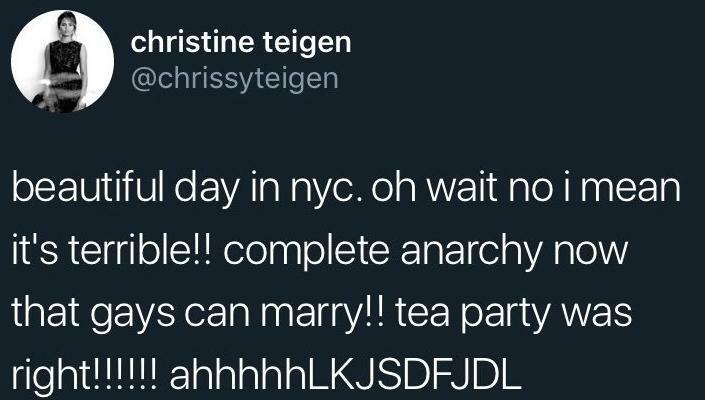 There are users arguing that Teigen didn't necessarily say anything bad in the tweet and that her comment about gay marriage being legalized was a sarcastic one meant to poke fun at the "tea party" she was referencing. Still, it hasn't stopped people from being up in arms about her jokes regarding Lady Gaga and Mariah Carey's bodies, or the fact that she seemed to have a problem with transgender contestants taking part in America's Next Top Model. 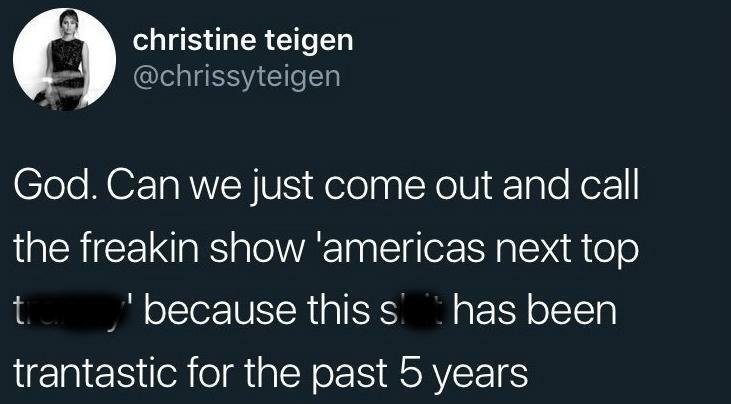 If the online hate brigade against her continues, ChrissyTeigen could ultimately find herself "canceled" by previous fans and former staunch supporters, which may impact her career. 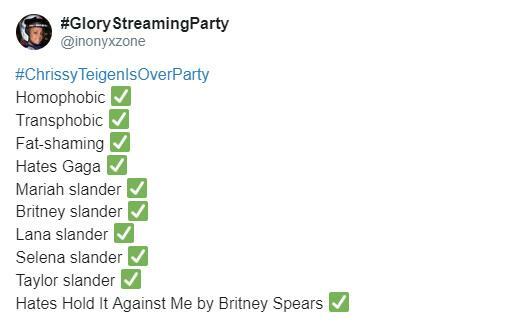 People have even started the hashtag, #ChrissyTeigenIsOverParty in light of the recent tweets and other "unbelievable" things the singer has done in the past. Like disliking the song, "Hold It Against Me" by Britney Spears. Long-time haters of Chrissy seem all too happy to celebrate her downfall, which is par the course on the internet. There are haters everywhere. 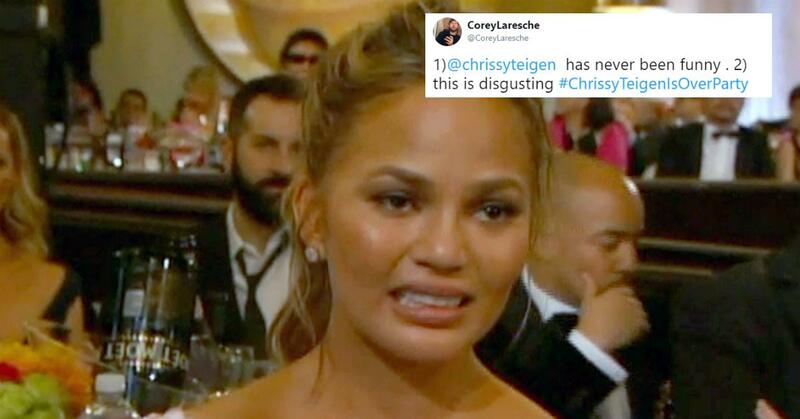 Chrissy isn't the first celebrity this year to feel the wrath of the "old tweet" storm either. Guardians of the Galaxy director James Gunn, the man who proved that obscure Marvel franchises could be blockbuster successes at the box office, also had his career torpedoed when jokes he made about pedophilia circulated online. Despite letters from the cast that supported James, and a strong refusal from the franchise's breakout star, Dave Bautista (Draxx) to work with another director, Gunn was still let go from the project. 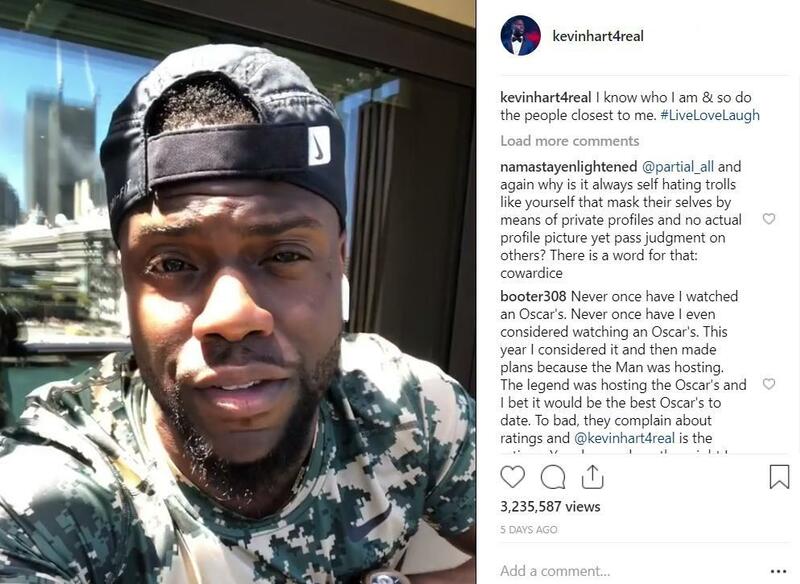 Kevin Hart also stepped down from being an Oscar host after old, homophobic jokes he tweeted and then furiously raced to delete started popping up online. What made things worse, however, is when he issued a "non-apology" that really seemed to grind people's gears. However, not every celebrity receives backlash for their old tweets, something Nick Cannon pointed out in his support of Kevin Hart after the whole Oscars fallout. The Wild 'n' Out host posted images of tweets by Chelsea Handler, Amy Schumer, and Sarah Silverman after Hart came under fire, with the caption, "I wonder if there was any backlash here..."
The tweets all featured the same words, or variations on the words Hart used in the tweets the effectively ended his hosting tenure. While some argued that it "wasn't the same thing", Nick clearly thinks there was a racial double standard at play. Especially when Twitter users began pointing out that two-time host Jimmy Kimmel never received backlash for his blackface, Karl Malone character on The Man Show, or the fact that he was featured on The Man Show at all. As for Chrissy, it seem the general consensus on the internet is that she's "cancelled." I hate that word and term all together, but that seems to be the case now. What do you think?